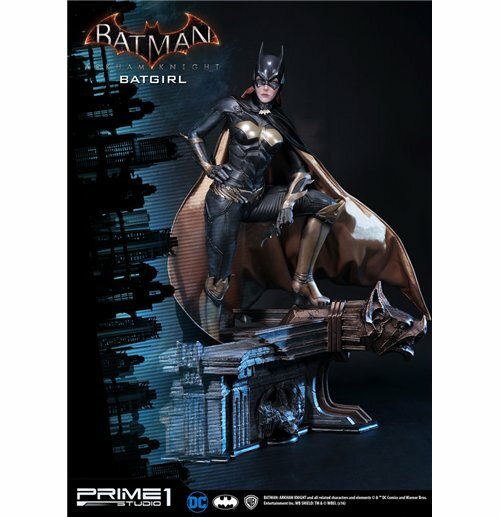 Prime 1 Studio is proud to present MMDC-14 Batgirl from the Batman Arkham Knight. Barbara Gordon is the daughter of Gotham City's Police Commissioner James Gordon, and was forbidden by her overprotective father from joining the GCPD. Instead, she took on the identity of Batgirl and was a crime-fighting partner of Batman's for years. Size: Approximately 74 cmAccessories include :-One (1) Switchable Normal Portrait-One (1) Switchable Smirk Portrait-One (1) Switchable Right arm Holding Batclaw-One (1) Switchable Relax Right arm -One (1) Switchable Left arm Holding Mini BatarangLimited to just 1000 pieces worldwide.Please note: Due to the size of this item, additional shipping costs may apply. Apart from your location, the actual package size and weight is needed to determine those costs. Both are unknown at this point and may not be available until the product arrives in our warehouse.